Seán with his hat and his hair. And a skull. Seán Manchester is an unhinged British author and self-proclaimed exorcist best known for his book The Highgate Vampire which was written subsequent to "vampire sightings" in London, England during the 1970s. Manchester claims to be a skilled "vampire hunter" and to hold the title of bishop of the Old Catholic Church. 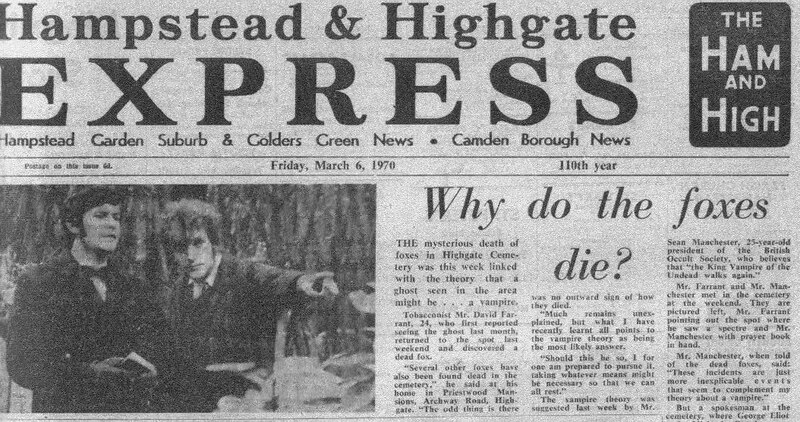 In March 1970, Manchester, described as "president of the British Occult Society", and David Farrant, described as a local "tobacconist", were featured in the north London newspaper Hampstead & Highgate Express. The Express connected Farrant's claims of seeing a ghost and finding dead foxes in Highgate Cemetery with Manchester's beliefs that a vampire was loose in the old graveyard. The British tabloid press picked up the story and gave it intense coverage. Manchester and Farrant each appeared in the press and on television talking about his plans to hunt down and destroy the "vampire". After one ITV broadcast, a mob of thrill-seekers swarmed the cemetery and climbed over the gates despite police efforts to control them. The press hysteria eventually waned, but Manchester and Farrant's reputations as rival "authorities" on the matter were firmly established. Manchester published his opus The Highgate Vampire in 1985, followed a few years later by Farrant's competing account, Beyond The Highgate Vampire. Their rivalry continues to this day. Manchester's knowledge of vampirism may have been inspired by horror novels and old vampire movies. His account of the Highgate Vampire has so many parallels to Dracula that Bram Stoker's estate could probably sue if it wasn't in public domain. This is a perhaps surprising situation, as most people who do believe in vampires generally follow folklore, rather than Universal Monster Movies. “”The supernatural vampire of folklore as defined in dictionaries, encyclopedias and non-fiction works is the matter of the Society's research and pursuit. In addition to his account of the Highgate saga, Manchester has published several books, including vampire fiction. In his book The Highgate Vampire Manchester claims that he personally tracked a vampire to its lair where he witnessed it "transform into a giant spider", which he bravely killed by pounding a stake through its heart and setting it afire with gasoline. Manchester claims to hold the title of bishop of the Old Catholic Church. But not just any bishop. He's a vampire-hunting, demon-exorcising bishop! Whether or not he's a real bishop in a real church isn't so clear. In his book entitled From Satan To Christ he claims to have infiltrated a "loathsome cult" of demon-worshipping Satanists, exposed their evil practices to the world via "sensational photographic evidence", and rescued an innocent young woman (who looks a lot like his present-day wife) from their clutches. Manchester makes the dubious claim of being a direct descendant of the poet Lord Byron, based on unidentified records of births and deaths showing that Byron had a child named "Lucy," while Manchester has an ancestor called "Lucille." The Highgate saga presents the collision of two strange and contradictory accounts of the supernatural, with both parties attacking each other. Manchester and Farrant each claim to tell the "real" story of the Highgate Vampire and essentially accuse each other of being frauds. This may stem from the fact that Manchester claims the title Bishop, and Farrant claims the title "occultist" or High Priest in Wicca. Or it may be simply a deep, personal conflict between two highly competitive personalities. When Manchester founded his British Occult Society, Farrant launched his own British Psychic and Occult Society. When Manchester published The Highgate Vampire, Farrant countered with his Beyond The Highgate Vampire. In the late 1970s, Manchester publicly challenged Farrant to a series of "duels" (some with swords, some with "magic") that were advertised around London. These apparently occurred before Manchester took up the title of "bishop." Today, Manchester maintains numerous blogs devoted to vilifying Farrant and calling him an "interloper" suffering from "narcissistic personality disorders". These are often illustrated with Photoshopped images and oil paintings that depict Farrant as a demon. In return, Farrant is involved in the distribution of a series of comic books called The Adventures of Bishop Bonkers as well as a line of Bishop Bonkers merchandise such as T-shirts, drinking glasses, and mugs. Manchester maintains numerous blogs that contain rants against perceived enemies which appear to number in the dozens. They usually feature a green-tinted or Photoshop-distorted picture of the victim and claims that the person is undoubtedly influenced by Farrant or Satan, which he considers to be the same thing. Manchester claimed to be a Catholic Bishop in a BBC interview. “”I'm not a vicar, I'm a priest and a bishop. I'm a Catholic. —Sean Manchester in his BBC interview. However, Manchester is not a bishop of the Roman Catholic Church, as one might expect from his reference to being "Catholic." Manchester claims not to be just a member, but the UK Primate of the British Old Catholic Church. Bishop Manchester seems to have a somewhat turbulent relationship with British television and radio, having made at least three complaints to the UK communications regulators. All of them revolve around the matter of how he should be described. Two complaints made against radio stations in 2002 were upheld in part. In the first His Grace didn't like the fact that he was not addressed as Bishop during an interview, and in the second he complained about being referred to as a "self-styled bishop of what he calls the Old Catholic Church". The regulator decided he was a bishop in each case. The third complaint, made in 2006, was in respect of the Highgate vampire hunters (including Manchester) being referred to on a Channel 4 programme as "1970's weirdos" and other things. Ofcom, who were handling the complaint, ultimately decided in this case that calling him a "1970's weirdo" was fair comment. Bishop Manchester had not denied that he had, in the past, carried out an exorcism and he was published describing the traditional method of dispatching a vampire as being to drive a stake through its heart before beheading it and incinerating the remains. So if we follow Ofcom's decisions — which His Grace has elsewhere encouraged us to do —- there is no doubt that he is a bishop and a weirdo. Bishop Manchester's concerns about his public image do not stop with mainstream media: he also appears overly preoccupied with negative comments made about him on virtually any part of the internet, including the article you're looking at right now. Manchester posts on several blogs (see external links below). As of January 2010, 5 out of 6 of his posts on the Bishop Seán Manchester blog are concerned with RationalWiki, and Mustex in particular, who started this article. Having made pedantic criticisms of this article's content, accompanied by vague intimations about possible legal action he proceeded to do the same with the comments on the article's talk page. He has even made a brief appearance on-site, or at least somebody "authorised to act on his behalf" did, (posting under the Latin name "Episcopus") to make more explicit threats and demands. This seems to be part of a repeating pattern of internet feuds. Similar behaviour from Manchester, or somebody representing his interests, (posting under the Latin name "Exorcistate") can be found in the Fortean Times forums. A blogger calling himself Alexander Lucard has claimed that Manchester harassed him, allegedly accusing him of actually being the vampire Dracula. [note 1] When RationalWiki mentioned these claims in this article, and Manchester responded in his blog, the Bishop initially denied all knowledge of Lucard, and insinuated that RationalWiki was perpetuating defamation. Later he acknowledged that he had once got one of Lucard's websites shut down because of negative comments about himself in it, but had apparently forgotten the incident. Seán Manchester's books seem to be getting good customer reviews at Amazon. However, it's notable that all of the most glowing reviews come from a single reviewer (posting under the Latin name "Veritas"), who has also posted one-star reviews of vampire-related books which are hostile to Manchester or present Farrant's side of events. It would seem that this Veritas also has access to unpublished information about Bishop Manchester, including his private letters. In one of his/her book reviews Veritas claims that Manchester's body language during an interview was misrepresented in the text, concluding that the interviewer/author "is indescribably petty". In 2013, design student Aaron Manchester (claims to be no relation) published his plans to visualize the vampire-hunting exploits of Seán Manchester in a complex interactive 3D environment modeled after London's Highgate cemetery. The game is designed to run on PC, Playstation and Xbox platforms, with a projected completion date of June 2013. The game's objective is for a character called "The Bishop" to successfully locate the "head vampire" from among several tombs. He plans to include things such as catacombs, drains, religious items, and animated birds as interactive elements for the gameplay. It's entirely possible the two are not related, as the student Manchester confesses his glowing admiration for the vampire-hunting Manchester, saying that he first read of his alleged exploits at very early age, and has been fascinated ever since. So perhaps all it takes to soften the notoriously prickly Bishop and get him in a happy mood is a little good old fashioned flattery. In 2012, a man named Kevin Chesham published photos of a room in Manchester's home which he described as "a massed amount of Nazi paraphernalia; framed photographs of goose-stepping Nazis and German Officers giving the Hitler salute, swastikas on the walls, and most strikingly a photograph of Adolf Hitler in pride of place." A former friend of Manchester, Chesham says he was photographed in the room by the bishop's wife as a form of blackmail insurance. Manchester has issued a counter-blog claiming that his "historical militaria collecting hobby" had been misrepresented, and vilifying Chesham as "the real Nazi". Is there no end to his blogging? ↑ In case you didn't notice, A Lucard (or Alucard) is "Dracula" spelled backwards. The alternate name of Alucard is one of the oldest memes in vampire fiction, probably originating in the 1940s film Son of Dracula, starring Lon Chaney Jr.
↑ So. An (Ofcom sanctioned) weirdo who is known to threaten litigation to anyone who even mentions his name online suddenly gives a student who just happens to share his name permission to turn him into a vampire hunting game character. Just letting that sink in. ↑ Bill Ellis (2000). Raising the Devil: Satanism, New Religions, and the Media. University Press of Kentucky. pp. 231–. http://books.google.com/books?id=oLcqlypMCe8C&pg=PA231. Retrieved 2 March 2013. ↑ The Right Reverend Seán Manchester, O.S.G. ↑ Ofcom broadcast bulletin 58 Apr 2006, pages 44-50. The whole judgement makes interesting reading. ↑ 29.0 29.1 "Falsehood about me on Rational Wiki"
↑ 30.0 30.1 "Yet more falsehood on Rational Wiki"
↑ See the "Bishop Seán Manchester and his Church" thread from 2002. Be warned: this runs to over 60 pages, and comments suggest that there were already ongoing conflicts between Manchester and other forum users from previous interactions. For a quick example, see his post on page 3 of the thread. ↑ Review of Blood Lust: Conversations With Real Vampires by Carol Page. ↑ http://therightreverendseanmanchester.blogspot.com/2012/05/kevin-chesham.html Manchester bemoans Chesham's "betrayal"
This page was last modified on 6 January 2019, at 14:38.